What do you get when you combine cool glass with muggy summer air? A major annoyance to homeowners. Summer window condensation frustrates many homeowners. Unlike its cold-weather counterpart, summer condensation forms on the outside of the glass, making it challenging to wipe away on upper level windows. Sweating windows fog up the view, and if it happens regularly, the condensation can seep into window frames to peel paint and form mildew. Luckily for homeowners in Northbrook, McCann Window & Exteriors has the solution. Switch to double-pane windows. If a renovation project is in your budget, it’s time to upgrade your windows. Insulated glass is a simple solution to condensation problems. Energy-efficient coatings are another simple solution. Energy-efficient windows reduce the amount of heat that transfers through the glass, which often prevents condensation problems that can occur with non-treated glass. Adjust the thermostat. Condensation occurs when hot air meets cold air. 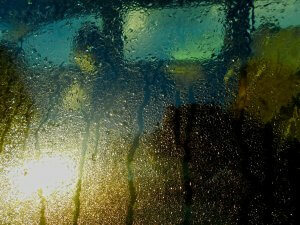 Just like when your car windshield fogs up, an easy solution is to minimize the difference in air temperature. Adjust the thermostat by a few degrees and monitor the window condensation to see if it shrinks. Check the humidity. Depending on the humidity levels in your house, using a dehumidifier may solve your window condensation problem. If you’re using a humidifier in the house, turn it off until the weather cools down. Crack a window. Not only will you get a breath of fresh air, you’ll improve air circulation around the windows. Do you have condensation problems? Call McCann Window & Exteriors in Northbrook, IL.